Your garden should be your own private place for solitude, a dedicated quiet space that gives you respite from the hustle and bustle of city living. Noise affects how restful a garden feels, and unwelcome noise from road traffic or mechanical systems can put a damper on your outdoor serenity. However, you can change the noise level in your garden with a few simple design tweaks. Now is a great time to plan how you can implement these ideas ready for spring. Identify, with as much accuracy as you can, where the noise is coming from and how it’s reaching your garden or patio. Whether the noise you’re trying to block is ambient, such as adjacent traffic, or single-source, such as a neighbour’s air conditioner, the tips here can help you create quiet in the garden. 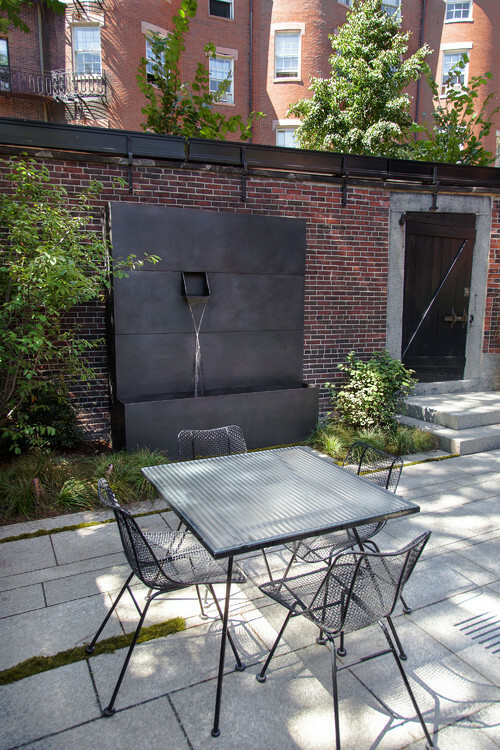 The designer of this tiny urban garden used many sound-reducing ideas to create a private oasis. The dense vertical planting, location of the seating area and sound-absorbing ground materials all help to block noise. 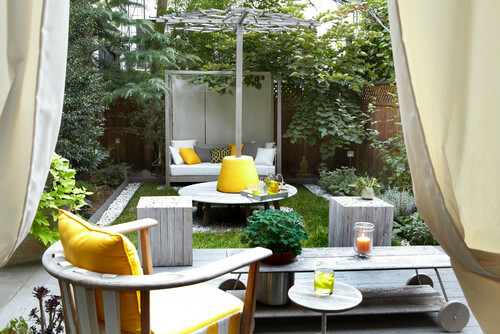 Think about the entire vertical space and perimeter to block noise from disturbing you in your garden. Plant different woody and evergreen species in vertical layers: upright trees and grasses as the tallest layer, shrubs and sprawling plants as the middle layer, and shorter perennials and ground covers as the bottom layer. 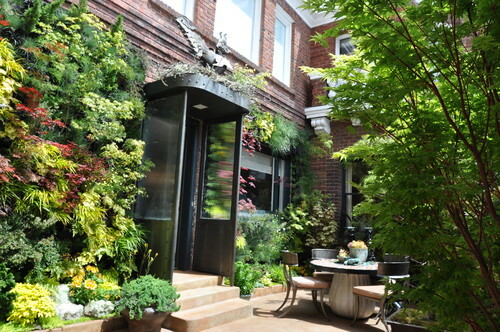 Living walls and hanging gardens can help you achieve vertical layering with limited space. This courtyard features vertical planting and layered plants, with green walls and a variety of plants at different heights. If you are limited to planting only in containers, use all of the available space in your pots, planting each one fully. A large container, like the one shown just beyond the door in the photo here, can have a small tree, low grasses and trailing vines all planted in it. Combine plants to achieve as much vertical layering as you can to reduce noise. You can plant a living hedge in narrow garden spaces using upright, columnar trees. Some popular tall and skinny trees that provide quick vertical vegetation include columnar varieties of red maple (Acer rubrum ‘Columnare’), sweetgum (Liquidambar styraciflua ‘Slender Silhouette’) and European hornbeam (Carpinus betulus ‘Columnaris’). Columnar plants are bred to grow upright, and they can be maintained as skinny hedges with regular pruning. Here, columnar hornbeam (Carpinus betulus ‘Fastigiata’) is planted in a container garden on a rooftop. Columnar hornbeam can spread wide if left unpruned, but it responds well to harsh pruning to keep it shaped as a hedge. Think about how you can create a bubble of vegetation that surrounds your space to block out sound. Dense vegetation, planted as a sound barrier around your garden, will filter some of the noise. Trees in 23 or 45 litre sizes can be planted 10ft apart to dampen sound and mimic a woodland setting. They will grow more upright, instead of branching out wide, as they compete for light. Plant the perimeter of your property thickly with trees, but leave open space in the middle to allow sunlight in. 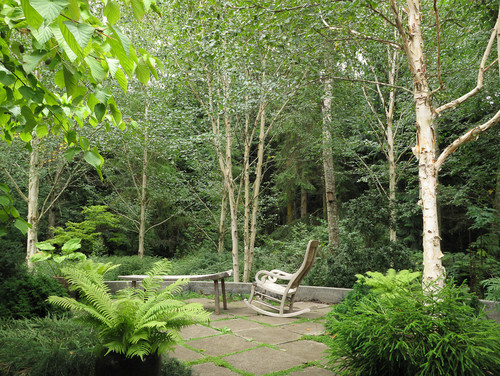 Small multi-stem trees are good candidates for this type of planting in small spaces: consider birch (Betula spp. ), serviceberry (Amelanchier spp.) and hollies such as possumhaw holly (Ilex decidua) or yaupon holly (Ilex vomitoria). This garden is woodland of paper birch (Betula papyrifera) planted densely with other layers of vegetation. Get tips of creating a lush, jungle-style haven. One way to drown out unpleasant noise is to actively create pleasing sounds. Water is a simple way to do that. You don’t have to use a lot of water to create sound, and there are many products that are suitable for small spaces. Water can create many different sound effects, including bubbling, fizzing, pouring, flowing, dunking and spraying. Music works, too. Sometimes just having a radio outside, turned low so you are being a good neighbour, can help drown out the noise. 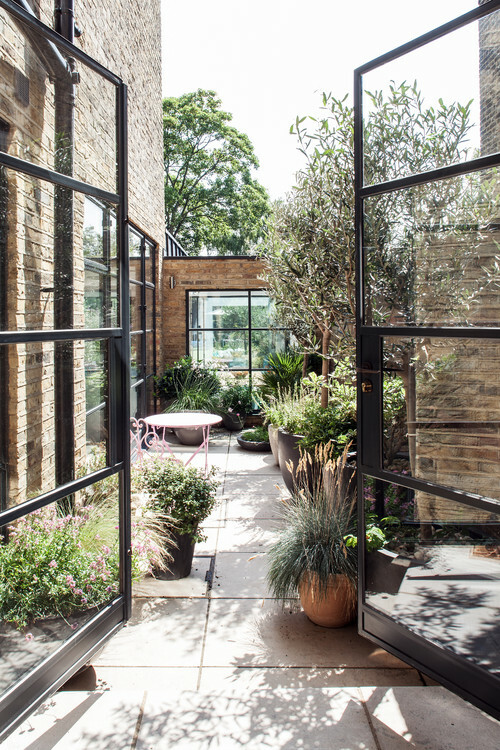 If surrounding your entire courtyard or urban garden with dense plants is not feasible, make one quite spot in your landscape by surrounding and enclosing just that area. 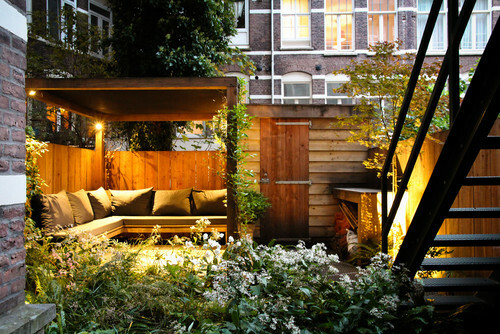 The pergola-covered seating area in this Dutch urban garden creates a quiet section in one corner of the outdoor space. 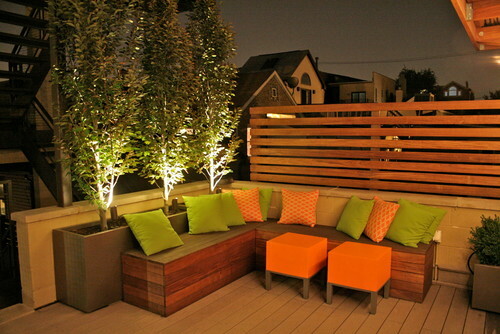 Every surface in your outdoor space, especially if it’s small, is going to either amplify or absorb sound. Consider each surface and how that surface can be changed to absorb sound instead of reflecting it. Your outdoor furniture, for instance, should have soft elements, such as outdoor-rated, weather-resistant cushions and textiles. Search for garden furniture with soft, sound-absorbing materials. The ground is a big amplifier of sound in small urban outdoor areas, especially when it’s made of concrete, metal or stone paving. Integrate as many areas for ground cover as possible, either planted in the ground or in wide containers, to create a textured surface of plants that absorbs sound. 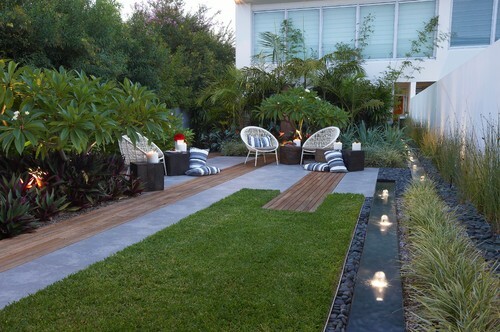 This garden features a mix of decking and ground cover that breaks up the ground plane with sound-absorbing textures.